Summary: This case study explains how F.E. Moran Mechanical Services (MMS) saved Astellas Pharma thousands of dollars each year by streamlining their condenser water system process. Approximately $30,000 in energy costs identified as wasted each winter. MMS finds a solution to simplify their processes and save on energy. New system is estimated to cost a mere $1,600 each winter and eliminate a risky cooling tower. Astellas Pharma reached out to F.E. Moran Mechanical Services due to an irritating quirk with their HVAC. They have a condenser water system that needs to maintain 70 deg.F, so they used chillers throughout the winter for the ambient heat to prevent it from freezing. Something needed to change. The former system caused an increase in energy bills and the need for an added cooling tower to complete the bypass loop. How could the system be simplified to increase energy efficiency? 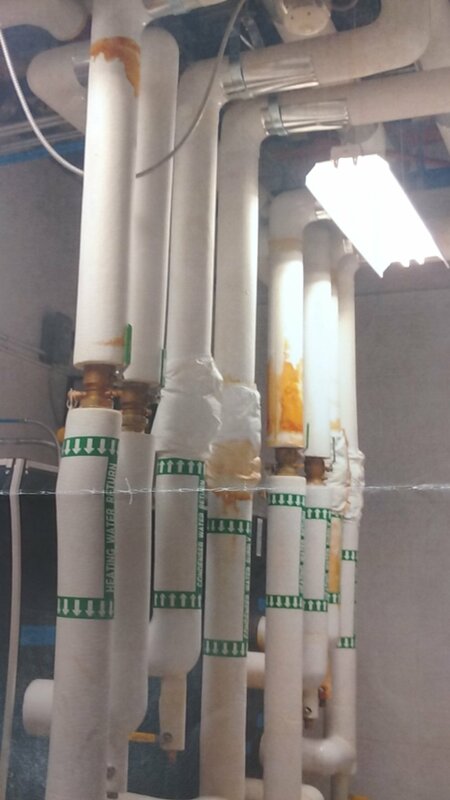 The pharmaceutical giant knew they had an HVAC system issue. The system wasn’t as efficient as it could be. The condenser needed a heat source to keep the water warm enough, but the current system was using the chillers’ ambient heat to do the job. With this, they needed to add a cooling tower to complete the bypass loop. The addition of a cooling tower caused its own set of issues. The fear of freezing. On an especially cold day, Mike Maloni, Service Project Executive, witnessed antifreeze used to keep the water in the cooling tower from freezing, frozen. If no cooling tower was needed, the issue of the water in it freezing was solved as well. F.E. Moran Mechanical Services added a small boiler to keep the condenser water at the right temperature. Now, a proper heat transfer is solving the temperature requirement issues. This also eliminates the need for a cooling tower. The next project is to remove the cooling tower. We will add a bypass loop to shut down the cooling tower. Previously, Astellas needed the cooling tower to complete the loop for the chiller, but with the boiler, the cooling tower is no longer needed. The cooling tower added extra issues. There was a risk of freezing that can create hairline fractures. The fractures could cause devastation with an inevitable leak. Maloni said, “The low-temperature water (approx. 50F) allowed the boiler to run in its most efficient range of around 98%, resulting in low operating costs.” The new boiler system is predicted to cost $1,600 per winter. The elimination of chillers saved $25,000 a winter to operate and the cooling tower approximately $5,000. With the elimination of the cooling tower and chiller, the new boiler and more efficient HVAC setup will save over $28,000 per winter.